Should I Buy Amazon Stock After Q1 Earnings? Subject: Should I Buy Amazon Stock After Q1 Earnings? four × = 20 Required Please enter the correct value. Yes, the Amazon stock price has rocketed 40.7% over the last year, making it one of the best-performing tech stocks of the year. And AMZN shareholders hope it will continue higher once Amazon.com Inc. (Nasdaq: AMZN) reports Q1 earnings after the bell Thursday, April 28. But some investors worry shares of the e-commerce giant are about to peak. After all, Amazon stock is just 11% from its all-time high of $693.97 reached on Dec. 29. That's why we're going to tell you whether or not you should buy Amazon stock after it reports earnings this week. 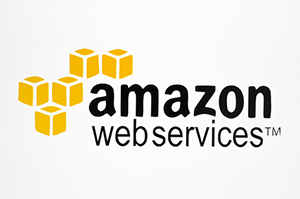 Besides EPS and overall revenue, the big figure every investor will be watching is Amazon Web Services (AWS) revenue. AWS is Amazon's biggest source of revenue. The cloud-computing service, which helps companies like Netflix Inc. (Nasdaq: NFLX) stream video, raked in $7.9 billion in 2015. It generated $2.4 billion in just the fourth quarter alone – a 69.4% increase from Q4 2014, making it the world's largest provider of cloud infrastructure. But the AWS growth alone couldn't save Amazon's overall performance in Q4 2015. The company missed estimates across the board that quarter, earning $1 per share versus the expected $1.56. Revenue also came in short of the $35.9 billion target at $35.8 billion. The Q4 earnings miss caused Amazon stock to plunge 12% in after-hours trading. Shares continued to fall 16.4% over the next week to their lowest level since October. For this week's Q1 2016 report, analysts expect Amazon to earn $0.58 per share on revenue of $28 billion. That would be a huge increase from $0.12 per share on revenue of $22.7 billion during the first quarter last year. With high earnings estimates and stock volatility after past reports, investors want to know if they should buy shares of AMZN later this week. Should I Invest in Amazon Stock After the Q1 Earnings Report? Although Amazon stock is down 8.5% this year, we still think it's one of the best tech stocks to buy for one reason – the visionary leader at the helm. Jeff Bezos, the company's founder and CEO, is considered one of the best business leaders in the world. He's been coined an e-commerce pioneer due to his role in growing Amazon into the largest Internet retailer in the United States. Barron's included him in its annual list of the 30 Top CEOs of 2016. One of the biggest reasons for these honors is his initiative to enter the Internet of Things (IoT) market. The IoT highlights the connectivity of 50 billion devices to the web and each other. According to Cisco Systems Inc. (Nasdaq: CSCO), the IoT industry will hit sales of $14.4 trillion in just six years. And Bezos will enter the market with AWS IoT. Launched in October, this new service lets users connect their devices to cloud-based apps and interact with their other devices. Customers pay $5 for every million messages sent using the service. "The firm says it can support 'billions of devices and trillions of messages,'" Money Morning Director of Technology & Venture Capital Michael A. Robinson – a top tech analyst and 34-year veteran of Silicon Valley – told readers. "In other words, Bezos has once again broken ground for another multibillion-dollar web business." The Bottom Line: Amazon stock has seen incredible gains over the last 12 months. In fact, its rise has been so meteoric that investors worry the AMZN stock price will level off soon. 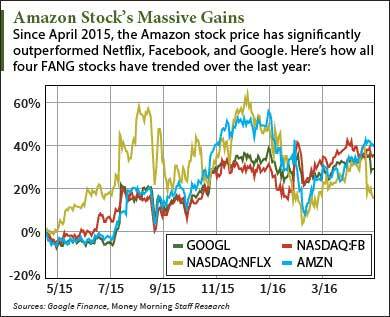 Regardless of whether or not the firm beats Q1 earnings, we recommend buying Amazon stock in 2016. With Amazon Web Services' market dominance and Jeff Bezos' initiative in the Internet of Things, the company's long-term growth is just getting started. Stay tuned to Money Morning for updates on the Amazon stock price after the Q1 earnings report Thursday. Follow the author on Twitter (@AlexMcGuire92) and like Money Morning on Facebook (DailyMoneyMorning).